~ When you are running errands, give a friendly wave to someone just because you can, or give them a nice smile and say, "Have a nice day!" ~ Give someone a hug. ~ Hold the door open for someone. ~ Instead of scowling at a mother with a crying toddler, give her a pat on the shoulder and tell her you understand. Go even further and ask her if there's anything you can do to help. Maybe ask her for a shopping list and help her gather the things she needs while she tends to the child. ~ Pay for the groceries of the person behind you in line, or pay for someone's meal at a restaurant. I personally know of one local family who recently had this done for them. It was anonymous. They, in turn, did the same thing for someone else in that same restaurant. 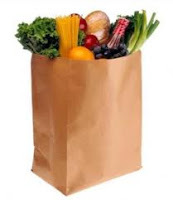 ~ Leave a bag of groceries on someone's doorstep who is in need. Do the "knock and run" sort of thing, if you prefer, so it remains anonymous. This happened to my family when I was young. My parents were involved with Child Evangelism Fellowship at the time and we were down to butter and crackers for our evening meal. We prayed and thanked the Lord for what he had provided and heard a knock on our door. A sack of groceries was there, but no one to be seen. It was enough to get us through until my dad's next "paycheck" arrived in the mail. 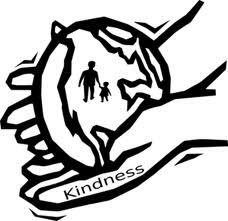 ~ There is an actual "Pay it Forward Day" that is set this year for April 26th. Here is a website dedicated to this day. It gives lots of suggestions and ideas for helping others: http://payitforwardday.com/ Of course, you don't need to wait until April 26th to bless someone else with an act of kindness. Thank you for sharing this Vicky! I think God is calling us to be Jesus to others! These are some great ways to do just that! Hugs to you today! Amen! How will they see Jesus, if we do not reveal His Character! People know His love by seeing it this way! These are great ideas, Victoria!